" We’ve been thrilled with the Kootenia experience. We wanted to create and we are. We wanted to choose everything and we have been. " " We wanted a partnership and we have it. We have been engaged through every stage; visioning, narrowing choices, deciding. But we haven’t done it all alone. " Every house is a partnership between homeowner and builder. Please see below featured testimonial as well as other testimonials for current homeowners. Testimonials will continue to load as you scroll or swipe down automatically. We’ve been thrilled with the Kootenia experience. We wanted to create and we are. We wanted to choose everything and we have been. What impressed my husband and I was, David Frosh listened to us with a complete understanding of our wants and needs in our new home. He had great experience in home building he was straight forward and answered all our question honestly. He even helped us with questions on our home we were selling. Kootenia Homes Inc does quality work. They build beautiful homes and their standards are above what I expected. Joe Braun was courteous and informative and always there when we needed his help. The entire staff work effciently and made us feel Important. Tim always answered our emails promptly and answered our questions. We would recommend this company to anyone for their building and remolding needs. Kootenia Homes Inc., completed out kitchen remodel in the summer of 2012. Al Patterson was out guide throughout the process. We are extremely pleased with the results and would highly recommend this company. The kitchen remodel included removal of a dropped ceiling and outdated cabinets, going back to studs. The project then included the installation of a new ceiling with can and pendant lights, new gas stovetop and double oven, refinishing floors, custom cabinets and granite countertops, and all new finishes (paint, tile backsplash, etc). The guidance from Al, the designer and the professionals at the tile, granite and cabinet shop made the selection process quick and enjoyable. The work was smooth, staying within time and budget. The cleanup and work process was excellent, always mindful of the family’s time and the fact that small children were around. Great Job. The transformation is amazing. A pool room remodeling project was started in August 2011 and completed in November 2011.We hired Kootenia Homes, Inc to plan, remove pool tub room,remodel it into a first floor home office, and complete finishing project. They did this on time and under budget. Al Paterson, Remodeling consultant and Project Manager, was our key contact and was a real professional to work with. Al has been involved in all kinds home remodeling and new home construction projects for many and is extremely professional in his approach to working with customers and very knowledgeable of this industry. 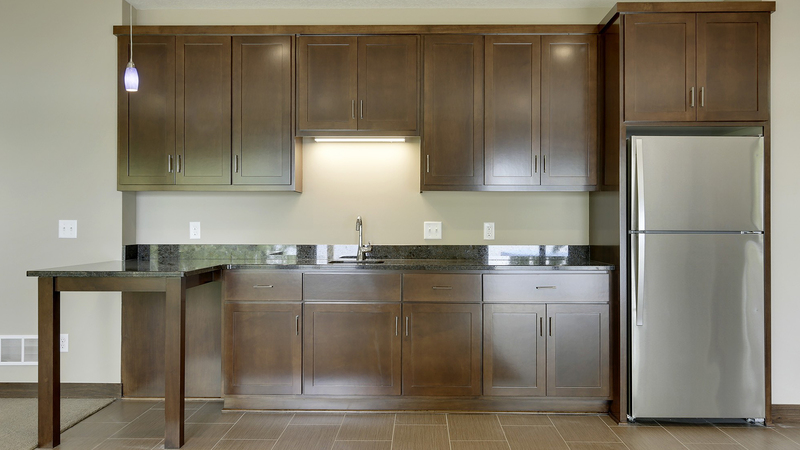 We highly recommend Kootenia Homes be considered for your home remodeling and/or new building projects. The company is very customer service orientated, extremely quality conscious, price competitive, and a great group of people to work with. We plan to use them again on future projects. I recently bought a model home built by Kootenia Homes The materials and construction are both very good and the house is quite attractive. Working with the builder was a pleasant process and I appreciated that my questions were welcome and answered promptly. I am impressed by the thought that went into designing a one-story home that’s perfect for people looking to ‘flatsize’ their lives. It’s a very convenient floor plan for the disabled or elderly. With minor alternations (cupboard height, etc.) this design could easily be made into a home for someone in a wheelchair. My husband and I built a new townhome with Micheal Lee Inc. We love our new home and would highly recommend them for your next remodel or new build. We have only good things to say about our experience with the process from beginning to end. Exceptional quality and exceptional team to work with! Everything was done on time and every detail was taken care of with no hesitation. Great experience! Tim and Linel Mehus, Woodbury Minnesota. Kootenia Homes Construction build our new home in the Wycrest Villas Development in Woodbury. We have been in the home since July, 2012 and are very happy with the workmanship. During the construction process the David, Joe and the contractors where very professional and a pleasure to work with. All of our deadlines were met and questions and problems that came up during and after the construction of the home were all taken care of to our satisfaction. We have received many compliments from friends and family about our new home. We are about to be blessed with a Kootenia Homes Home. We plan to call it home for many decades to come, raise a family there & live the most exciting years of our lives there. During our initial meeting with the builders at Kootenia Homes, we knew instantly that we had found fabulous people to build our home. We are very impressed with the high quality of work & beautiful end product. We are forever grateful for their incredible amount of patience with us as we experience this new journey of building a home. We appreciate the impeccable integrity of Kootenia Homes Inc & are eager to recommend them to friends and family. We worked with Al Patterson of Kootenia Homes and although it was not his normal responsibility to be the day to day contact for our project, he always made himself available to help and was quick to respond when issues needed to be addressed. Our overall experience was very favorable. Our timeline ran longer than expected but that was due to a problem matching some natural stone. In the end, everything turned out well and was worth the wait. We especially liked the work of his cabinetry and tile subs. David, Jay, Kristy, Steven, Joe and Clay are all a wonderful team to work with! They are building my dream home in the Kootenia Homes Wyncrest Villa development, Woodbury, MN. They are detailed, helpful and have a wonderful system for beginners during the building process. I love their custom building designs developed around my style choices and needs ……I’ve worked with their hand-picked contractors making this process easy and not overwhelming……..helping design my home from exterior to detailed interior selections……appliances, cupboards, granite, hardware, flooring, lighting, plumbing, paint selections, closet styles, doors…….I’ve utilize each individual designer’s professional opinion helping me pick my choices. My business is “in a barn” and I have no idea how to pick colors, designs and home selections that actually look great……….. I have my own office, a second bedroom on the first floor, finally!!! Seeing all my choices coming together and looking beautiful is so exciting….I close in a week and I LOVE MY HOME! I have always been told that building a home is a one-time-choice and you’ll never build again………well, I would build again with Kootenia Homes…………. I think this statement says it all.